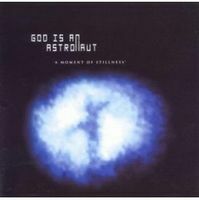 A friend recently loaned me a collection of his post-rock and post-metal albums, and among the more enjoyable offerings in that group was God is an Astronaut's A MOMENT OF STILLNESS. At EP length, it is a very nice bite-size chunk of atmospheric mood music that I have really enjoyed playing while I work. Like virtually all bands in the post-rock genre, the name of the game here is repetition upon repetition with long builds and falls of emotion. Most of this music ends up being a kind of background music for me, either while I'm doing something else or when I want to let my mind ease off into another little world. The difference between Post-Rock bands, for me, is how effectively the music allows me to do the latter. This EP does the job fairly well, thanks mostly to healthy doses of modern psych-pop sounds. The scenes that GiaA evoke for me are somewhat melancholy, sleepy affairs. Shadows lengthen as sunfall proceeds. A lonely swing lazily arcs on a fall day with brown leaves blowing about. An adolescent sits alone in her bedroom watching the dust swirl in a sunbeam. I think you get the idea. This is an introspective, moody music that certainly is going to seem boring to some listeners. It's not hyper math rock, it's not meticulous, lush symphonic prog, and with no vocals it's not even dream-pop. It's modern mood music, well done, but pretty limited in scope. I like this album for what it is. The musicians do a good job of layering and creating an atmosphere, but frankly there were plenty of bands doing this twenty years ago with a female singer adding addition flavor to the mix. Pleasant but not in the least challenging. 2/5.